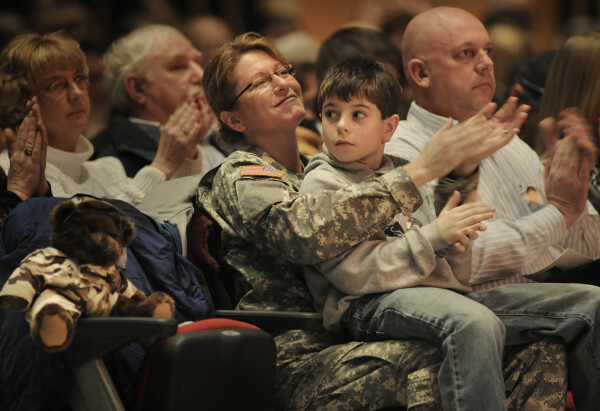 Diane Dunn attends a send-off ceremony for the battalion at Peakes Auditorium in Bangor in January 2009 with her son, Marcus, and husband, Jim Dunn, while a lieutenant colonel. Col. Diane Dunn is made brigade commander of the Maine Army National Guard's Bangor-based 120th Regional Support Group in June. Racehorse Western Stepp is shown with Col. Diane Dunn in Windsor, where the horse is boarded. The horse is owned by her husband, Jim Dunn. Diane Dunn of Glenburn, then a lieutenant colonel, addresses the Maine delegation, the 286th Combat Support Sustainment Battalion and fellow senior ranking military members during a send-off ceremony for the battalion at Peakes Auditorium in Bangor in January 2009. Col. Diane Dunn of Newburgh of the Bangor-based 120th Regional Support Group is the first female officer to take command of a brigade in Maine. "My other hobby is running," Dunn said. 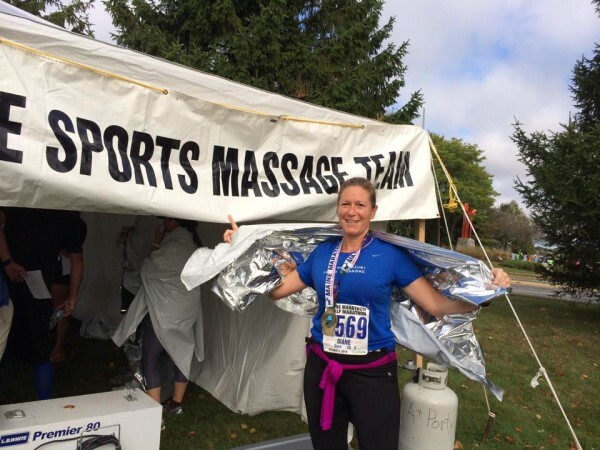 "This was from the Maine Marathon Half in October that I ran with my daughter Kayla ... our second half together this year." BANGOR, Maine — The alarm clock goes off at 4:30 a.m. for the Maine Army National Guard’s newest brigade commander, but the early wake-up call has nothing to do with her “office job” leading the 120th Regional Support Group. Instead, Col. Diane Dunn of Newburgh — the first female officer to take command of a brigade in Maine — gets up early every weekday to get her 15-year-old son, Marcus, to hockey practice. “I always say, ‘If you can do parenting, you can do Army logistics,’” the 48-year-old grandmother, who also has two adult daughters, said Wednesday. 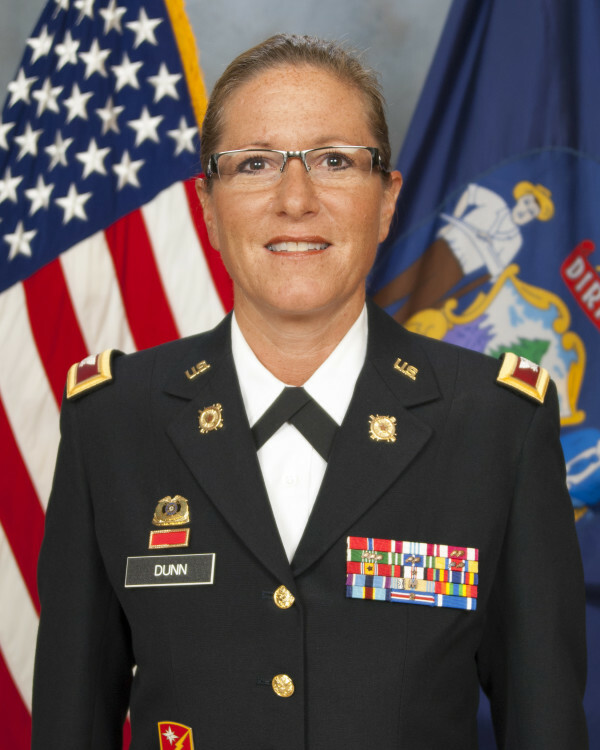 Dunn has 26 years in uniform and made Maine Army Guard history when she took command of the Bangor-based 120th in August, overseeing more than 1,000 soldiers within the 521st Troop Command Battalion and the 286th Combat Sustainment Support Battalion. She said the new post is a particular honor because “It’s so tight at the top” of the Maine Army Guard, especially for women. Dunn said she’s the only female in her peer group. The 120th Regional Support Group and its subordinate units have a total of 134 female soldiers, 86 in the 286th and 30 in the 521st. The Maine Army National Guard has a total of 262 women among approximately 1,600 soldiers statewide. The 120th’s budget is dictated by the ever-changing federal Department of Defense budget, which is undergoing sweeping cuts with the withdrawal of troops from Afghanistan after more than a decade. 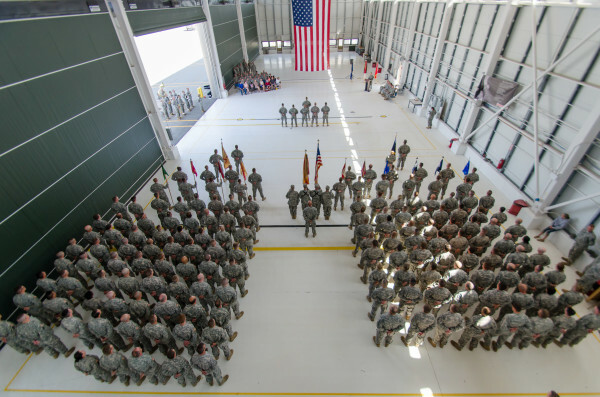 It was announced earlier this year that as part of the Army’s 2015 budget request, Maine’s other battalion, the 133rd Engineer Battalion, which has about 560 soldiers, may be affected. The bigger picture is that the National Guard Bureau may be forced to cut 45,000 jobs nationwide under the proposed budget and that likely would affect all Maine units, Dunn said. “I’m looking at what are the second and third effects and how do they support our long-term goals,” she said later. Her new job is a challenge at times, but for the most part it has been smooth sailing, Dunn said. The 521st is home to the 126th Aviation Medevac, 142nd Aviation Assault, 224th Aviation Assault, the 195th Army Band, and the Brewer-based 172nd Mountain Infantry. The 286th includes the 1136th Transportation Company, the 488th Military Police Company and the 152nd Component Repair Company. Those duties include reviewing and approving “discharges, awards, personnel moves, enlisting new officers, making decisions on future staffing and major training events,” she said. Between December and her promotion, Dunn served as deputy commander of the 120th under Col. Hamilton Richards, who is now deputy chief of staff in logistics. 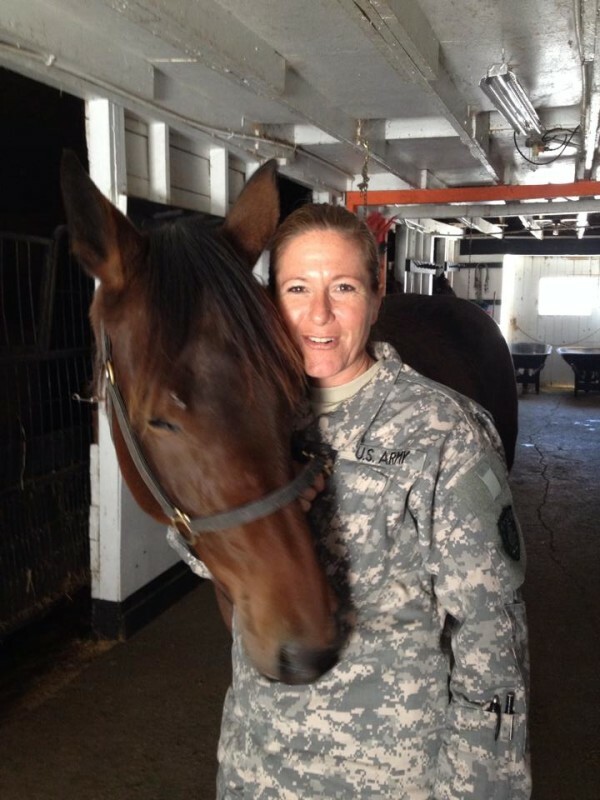 Leading the way is nothing new for Dunn, who was the first woman to serve as a commanding officer of a Maine Army National Guard overseas battalion when she led the 286th in Afghanistan during 2010. “Our job was to provide all supplies and support to combat units in southern Afghanistan,” Dunn said. “That did mean daily convoys off our forward operating base to complete our mission. This was not a daily or even weekly event for me as the battalion commander but I did go on several convoys with my subordinate units to understand their daily challenges and as a means to better support and advocate on their behalf. To do my job as a commander, I had to fully understand their subordinate mission. Those who want to climb the ropes in the military should take advantage of every opportunity for education, she said, adding she’s enrolled in an intensive 10-month online and hands-on advanced professional training course to prepare her to work with leaders in other branches of the military. Shortly after her return stateside from the yearlong deployment, Dunn was deployed for another year to serve as branch chief of the U.S. Northern Command in Colorado Springs, Colorado. While Dunn has participated in numerous educational opportunities that take her away from home for a week or two here and there, the rest of her time in uniform has been in Maine. Dunn said the brother of a roommate at St. Bonaventure University in New York encouraged her to check out the school’s ROTC program and once she put on the uniform she never looked back. She took the scholarship and went to Houghton College in New York, where she met her husband, Jim, who also is a Maine native. The couple now have three children, Marcus, Kayla and Kristen, and one granddaughter, Aaliyah. The couple now have three racehorses and provide board for others. 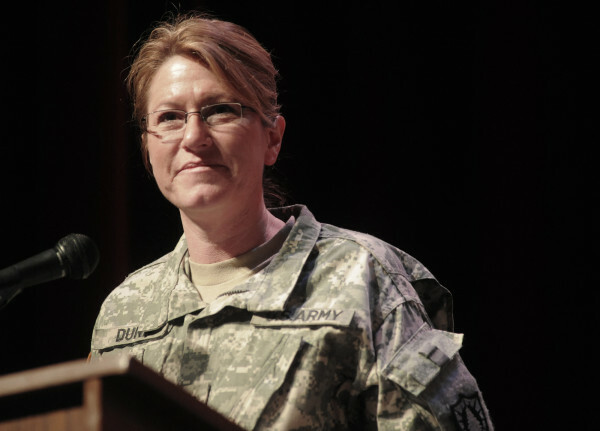 After graduating college in 1988, Dunn signed on with the Maine Army Guard and shortly thereafter had her first and only experience with sexual harassment, she said. Dunn has worn many hats over the years, including that of an assistant professor of military science at the University of Maine for three years beginning in 2002. One of Dunn’s co-workers, Lt. Col. Blair Tinkham, who has worked with Dunn since 1998, said he has been impressed over the years with her determination and drive. “I have seen her develop and evolve as a leader in every position she has held,” said Tinkham, who is the commander of 52nd Troop Command. “She focuses on solving problems versus just talking about the problem,” the lieutenant colonel said later. During Dunn’s promotion ceremony, Brig. Gen. James Campbell, adjutant general for the Maine National Guard, wished her well with her appointment. “Col. Dunn has some big shoes to fill but I am confident she will lead the unit to new heights and further solidify its reputation of excellence,” Campbell said. Being a wife, a mother of three and a grandmother while leading more than 1,000 soldiers and taking a night course is a lot to juggle, but for Dunn and her family it’s just a way of life. “It’s a lot of back and forth,” she said about scheduling. “Right now we’re making plans for how we’re going to sequence … [Marcus’] driver’s education, hockey practice and plans with a friend” with work and the possibility of having to pick up the granddaughter from preschool. “It’s something we’ve been doing for 26 years,” Dunn said. Correction: In an earlier version of this story, Sanford was spelled incorrectly.